Americans have always had a special relationship with their cars. The movie, "Cars," lets us take it to the next level. We actually get to become cars and live in their special motorized world. There's always been an element of freedom that has been tied to our passion for cars. A car was a ticket to another life if you needed one. You could always get in your car and just head to California or Canada. Just pick the destination, a car could set you free. I can highly recommend "Cars." It is the best movie that I've seen in a while. "Cars" shows what could always be possible with a little help from your car. For a couple of hours the movie lets you imagine the impossible. It also got me thinking about my first trip to a new world by way of a new car. It was a 1969 XKE which cost $6,900. At the time the money was slightly more than room & board plus tuition for a year at Harvard. I suspect it is well over $50,000 for a year at Harvard now. Jags probably cost even more. From the moment I sat in the driver's seat of the XKE there was no question that I was going to figure out how to buy it. It was something that could only happen once in a lifetime. The smell of real leather and the feel of polished wood was foreign to someone who had only driven American cars. The unbelievable smooth acceleration of the car was a wonder to behold. 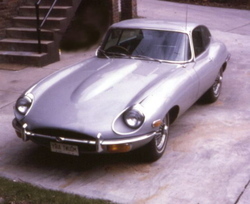 I traded in one of the great muscle cars of all time for the my silver XKE coupe. It was a Blue GTO convertible with a white interior and a racing cam, a functional hood scoop, and three two barrel carburetors. It was nearly identical to the one to the left which I captured in a Chapel Hill parking lot in the summer of 2004. My GTO came loping into any place it visited, sounding like an controlled explosion waiting to happen. It would bury you deep into the bucket seats. As a crazy teenager I once drove it to over 150 mph on a deserted stretch of newly opened interstate highway. It would burn rubber in any gear but fourth. I still have the wooden gear knob from the chrome Hurst shifter. I'll never forget the rumble of that GTO as it came into our driveway in Mount Airy, it was an American classic. One of my Harvard classmates once asked me to drag race him, I uttered one of my best lines ever, "So how many gears do you want me to spot you?" The Jag was a completely different beast. The GTO was brute force, and the Jag had an engine that seemed to rev forever without ever seeming strained. It would go around any curve twenty miles an hour faster than the GTO and do it effortlessly. It probably would have been beaten by the GTO in the quarter mile, but by 3/8 of a mile the GTO would have been watching the Jag's tail lights. There will never be a thrill as great as popping the hood of the Jag and have the whole engine and front end exposed along with those three beautiful Weber carburetors. It even had wire spoke wheels with knock off hubs. 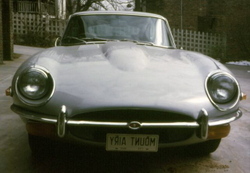 Yet the XKE was one of the most unreliable cars that I ever owned. The unreliability must have come from the British who have never accepted electricity. On the Jag's maiden voyage home from Boston where I bought it just before Christmas one year, one windshield wiper wouldn't work. I had to stick my arm out the window to clean snow off the windscreen all the way to Pennsylvania Turnpike. Once when I took it camping on Ocracoke, the air conditioning quit. The Jag had to have regular tune-ups at 2,000 miles and the only dealer was in Greensboro, NC, but the guy was a magician, the car would literally fly after the tune-ups. I would probably still have it, had I not gotten really stupid and wanted to have it at college my senior year when I was living with 300 young ladies in a dorm at Radcliffe. One morning I woke up and someone had stolen it. There was only a pile of glass where my silver Jag had been parked. 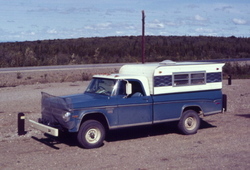 My other vehicle at the time was a Dodge Powerwagon with a PTO winch on the front that would pull it up a mountainside. I used the insurance money from the Jag to buy a Land Rover that would barely do 65 mph on the New Jersey Turnpike with a tractor-trailer breathing down its exhaust pipe. 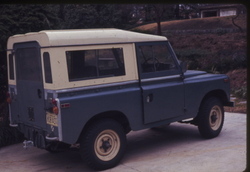 In the winter you had to wear a down jacket on trips since the skin was aluminum and designed not to rust. Of course being another car of British heritage, there was no thought to keeping passengers warm. Obviously smart Englishmen spent their time wandering around in a desert where it was warm instead of the frozen North. The Land Rover confirmed my belief that the British have no clue about building reliable vehicles except maybe for hot climates. Whenever I forded a stream which I did often in Canada, I had to stop take the distributor cap off and dry it out before continuing. The engine and transmission were one unit which is fine except when the transmission needed work. 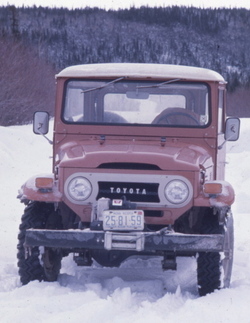 My next vehicle after the Land Rover retired was one of the original Toyota Landcruisers with a 8,000 lbs Warn winch on the front. What can I say. I lived on a cattle ranch in the wilderness. The vehicles were what I needed in that world. In these days of $3 per gallon gasoline, the GTO would be expensive to run. When I drove it around the country, it got about 8 miles per gallon which wasn't much different than than the mileage I saw on the trip to Alaska that I took with the Dodge Powerwagon. It was an old style heavy duty 3/4 ton truck that rode nothing like my the silky smooth 2004 Nissan Titan truck that I used to have which got 15 miles to the gallon. As an update from 2014, my current favorite vehicle is my 2005 Acura MDX which now has 110,000 miles. It is my second MDX and it is a great vehicle. It got me up and down the hill in Roanoke at times when almost nothing would move. Of course given my choice I would like be in either the boat or kayak, both of which are in the background. If nothing else you have to love the Acura for its front license plate. If you have ever just driven off a snow covered road in your fancy car, that big farm tractor with ring chains on the rear wheels is a very welcome sight. In the very white world of Canada where tow trucks are often as scarce as bare roads, farm tractors are kings. Some of my best rides have been John Deere tractors. I loved my 3130 and and the 2120 that my first tractor was a great green beast. When you mention special relationship, it makes me think of the names that some people give their cars. Well, if you're going to count everything in this type of relationship, it's not just cars which would be given human names. Anyway, those are pretty cool rides you've shared there. It seems that you've had some ups and downs with 'em, too. I love the first Cars movie too. It wasn't as good as other Pixar offerings, but it's a showstopper for car lovers like us. Wow, I like the way you chronicled your vehicles from past to present. I have one of those original Toyota Land Cruisers. Mine is a former rescue unit that saw a lot of abuse over the years. But despite its age and condition, it's a very reliable vehicle. Nothing can stop a Toyota HiLux, they say. As it turns out, nothing can stop a Land Cruiser too. That car in the second picture reminds me of my first ever car ride. My grandfather used to have that too. When we were cruising on our way to our farm, it seemed like forever because my grandfather drives real slow. Anyway, Cars does remind me a lot of my child hood days, and every time I think about it, it makes me smile! Amazing cars!! I have many vintage cars and I keep it carefully in my car workshop. I have many latest cars also with advance technology and sensor system.